"Hometown Summer". This collection is pretty much the cutest summer collection I have seen in a long time. Seriously, folks. 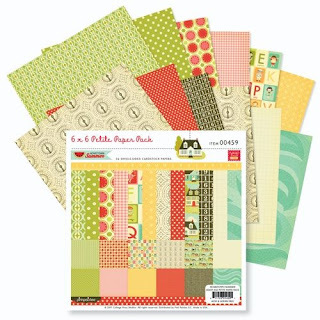 The patterned papers are bright and fun, the images are adorable, and there are sooo many embellishments, its hard to choose what to use and what to hoard... err I mean save for later... There are banners, layered chipboard, acrylic buttons, rubber charms, die cuts, rub-ons... Oh! and stamps! You know, I love me some stamps! Well, this won't be hard, I really love sooo much about this collection. - There are a TON of embellishments. So many, in fact that I couldn't decided what was going to make the cut. Scrapbooking... cut... get it? Okay, moving on. - The colors are so very perfect for summer, but this could very easily be used for school, sport, or even vacations projects. - The paper pack has 4 of every double sided sheet! WOW! No need to hoard your favorite patterns. Go ahead and use those beauties! -The stamp set has a lot of images to choose from! You get a couple of those super cute kids, a journaling spot, a house, a banner flag, and many more! -I would have liked to see an alphabet sticker sheet. Is that greedy of me? Especially since "there are a TON of embellishments"? - The borders are adhesive, but not super sticky. I had to add some adhesive to prevent my banners from falling off my projects. Bottom Line: This a great collection, sure to fit your needs for summer projects, school, boys, girls, and beyond. What do YOU think? Is this a collection on your "to buy" list? Are you on the fence? Or do you already have it? What do you like or not like about it? Leave a comment by midnight EST on Tuesday to win a prize pack from Pink Paislee! This collection just screams fun! Looks great for a summer vacation. Bummer about the not so sticky banners, but they are at least super cute! Seems like a lot of things lately don't have sticker alphas, I wonder why? But the colors are so bright, I know I have a few alphas from other various things around that would work wonders with this (maybe that's why sticker alphas aren't in the set?)! I love it! :-) I appreciate that your reviews are objective and fair! I've got a tiny bit of Home Town and I definitely need MORE, lol. My fave from the collection is the generous package of borders. Love what Mandy Kay did with this collection. What a fun line! I haven't picked this one up yet, but definitely plan to. I love the bright happy colors and designs.A welcome end to a dreary winter-they make me smile just thinking about all the wonderful cards and layouts I could make with them. Love that you all always give any negatives about the product. I've never owned any Pink Paislee but would love to have some. This is a cute line! I don't get to buy Pink Paislee at my LSS, so I'd love the chance to play with some of it. Thanks for the chance! I love the bright colors in this collection! I didn't know that the paper pack came with 4 of each! That's WONDERFUL! I love that when I'm not feelin' the cutesy, there are amazing b-sides to work with. Love that!!! This collection is so sweet! I love Pink Paislee and this line is uber cute! Now that I see all the great ways that you used this super cute line it has gone from my on the fence list to my must buy list! Thanks for the review! This line looks to be extremely cute and lots of fun to work with. I don't have any yet but it's on my wish list! I agree, the colors are perfect for summer and very versatile. i must be living under a rock. I've never heard of Pink Paislee. I really like that the papers have more than one or two sheets per design. This is now on my must have list. Love your projects, Mandy! I think this line is the cutest! 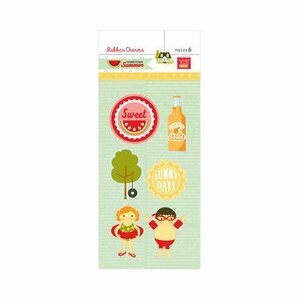 From the house patterned paper to the adorable kid images...it would be so fun to scrap my family's summer memories with this line! Love your layout, especially the second one! This collection is so fun and cheery! I love the colours and papers. But I almost never use embellishments, so I should like more paper and less embellishments. You made great pages and a nice card! Love the bright happy colors in this collection! Really adorable images too. I haven't see these at my LSS quite yet. Will have to keep an eye out ! I love the fun colours and that soda sticker is too cute! It's such a cute collection. I've seen it around archivers and have not taken the leap yet. I think this just made up my mind. Thanks for the chance to win. I think line is perfect for little girls enjoying the summer. Pretty darn cute if you ask me. Super cute and I would love some of these for my LOs of my kidlets. Plough so cute and perfect for my summer! I want sssooo bad! I hope I win! I love this collection! And no I don't have it yet-but I am sure to get it if I don't win it! This collection is absolutely adorable. I just adore those little houses, they remind me of one of the first lines OA came out with. This line looks so fun! Thanks for the chance to win! This line is a must for me...I LOVE it! Love the bright colors and embellishments! OMG! Saw it and fell in love - this is so super cute & has absolutely gorgeous colors! I like the fresh colors of this line! And those kids are so cute! Mandy, I enjoyed reading your review! I have never owned Pink Paislee, but as an avid paper crafter I have heard of them. Clearly they know what paper crafters are looking for: 4 double-sided papers, thank you! Not to mention the cute-but-not-cutesie embellishments with pennants, chipboard, buttons, charms, die cuts, stamps, rub-ons, and GREAT color scheme. Thank you for the opportunity to win this amazing collection. Cute collection. I would like to have seen an image of the stamps included. Thanks for the chance to win this collection, love the fresh colors and the fun patterns. Perfect for summer projects, can't wait to play with this new collection. Love the colors in this set. I also think that they would be perfect for summer pictures. I also like the idea that you get 4 sheets of each paper. That sounds like a real bonus. love Pink Paislee and this collection. Love your projects. Thanks for the review. This line is so perfect for all the summer time fun with the kids. Lovely collection!! I love to scrap summer and those brights are just perfect. Lovely projects in the post too. I LOVE this line! The colors are gorgeous - thanks for a chance to win it! I am really into the whole homey looking papers being released lately, so I will HAVE to pick this up if I don't win it that is! :) Thanks for the chance to win! Yep, I NEED this collection! This sure is a bit different from Pink Paislee. Not too sure. I've scrapped my boys younger photos. I'd have to have a closer look. Like the colours. I do have some of it but want more! I am using for summer layouts but so need more for back to school!! !